The cave temples can easily be visited in a morning or an afternoon, and are well worth seeing, although they aren’t included in the Cultural Triangle round-ticket and the entrance fee is now (July 2011) a steep R1200. The caves have a long history as a place of worship and some of the statues and paintings within them date back to the 1st century BC. 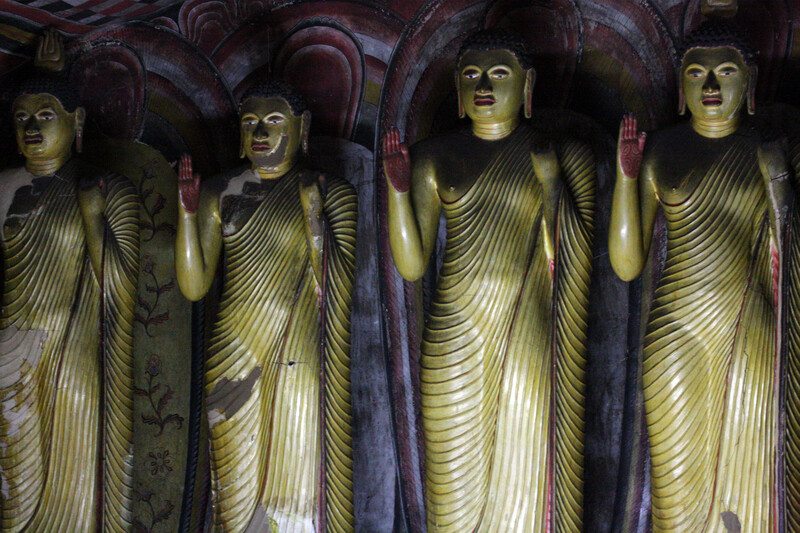 During this time the Sinhalese king Valagamba was exiled from Anuradhapura and sought refuge among Buddhist monks meditating here. After he regained his throne he had the caves transformed into rock temples, to show his piety and his gratitude to the monks. 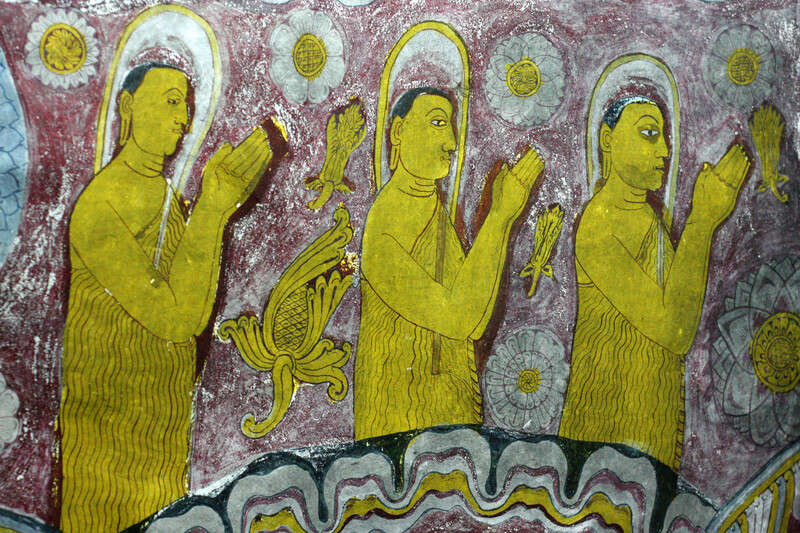 Since then the caves were added to by later kings, and they have been repaired and repainted many times. There are five caves, containing over 150 statues of Buddha, as well as statues of kings and of the Hindu gods Vishnu and Ganesh. They differ in size and each has its own character. 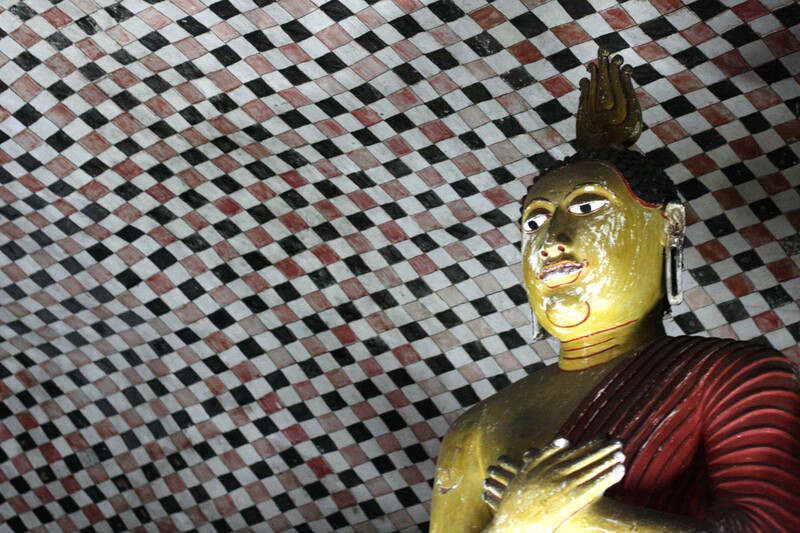 I particularly liked the huge reclining Buddha crammed into Cave I, and the murals that covered every surface of Cave II. Some of these patterns and decoration reminded me of contemporary art paintings. There are excellent views over the surrounding countryside, and the troops of toque macaque monkeys are very entertaining to watch. Be careful about getting too close to photograph them as monkeys are unpredictable: try to watch their body language for signs that they’re agitated. At the bottom of the hill is the modern, kitschy Golden Temple, with an actually quite impressive, 30m high Buddha statue sitting on top of it. The temple’s museum is included in the ticket price, but it’s a waste of time!